Raizo is a professional ninja. No seriously, if he had a business card, it would be a shurkien. And you wouldn't be able to contact him. Cause you'd be dead if you met him. Because he's a ninja. Anyway, he was raised as a ninja after being orphaned by his parents. Trained and then betrayed by The Clan of the Black Sand, Raizo is looking for revenge. Fortunately his old clan is hunting for a forensic investigator that is right on the cusp of revealing the existence of ninjas so Raizo decides to kill (haha) two birds with one stone and protect Mika while exacting his revenge. Oh, what could have been. 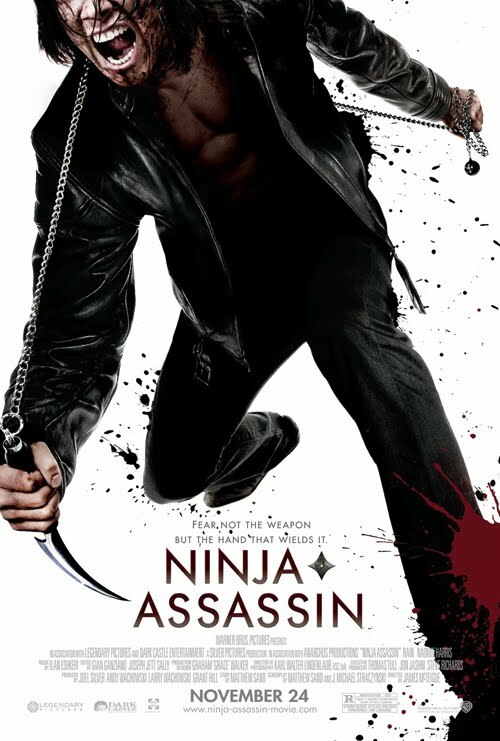 Ninja Assassin looked RIDICULOUSLY epic from the commercials and while the last 30 minutes is pretty much nothing but an epic ninja fight over several different locales, it just wasn't enough for me. The action was great and visceral and shot extremely well but there just wasn't enough of it. If I'm going to see a 99 minute film about ninjas I want non-stop ninja fights. This film simply spends too much time making us try to care about the characters. We already care! They're ninjas! Look at that plot summary I posted up there. It is far too wordy. It should have read like this. "Ninjas." James McTeigue is a more than capable director and the Wachowskis are solid writers but they've fallen into the same trap they always fall into. They like the sound of their own voice. Too much backstory and political intrigue clog up the first hour or so of the film. Though I suppose this makes the pay-off that much better. Once the last ninja battle starts it's on such a grand scale that it makes me realize how much better every movie would be with ninjas. Another thing about this film is that ninjas are awesome. But then I realize that they do everything in the dark. This means the lighting for most of the fight scenes is quite poor and can end up looking like someone turned the lights out on "300". Overall, Ninja Assassin is a mindless action film that is too intellectual for its own good. Perhaps this comic will help you understand how I feel.